This is an oldie but goodie that I had not made in a few years. Due to raspberries not being in season all year, these are great during the warmer months when you picnic or cookout more. 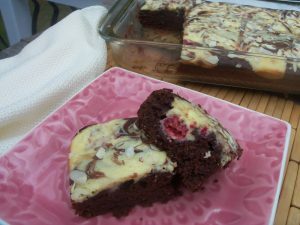 A chocolate brownie swirled with a cream cheese batter that has fresh raspberries and topped with sliced almonds will delight your taste buds! Enjoy! Preheat oven to 325 degrees. Lightly spray or butter a 13×9 glass baking pan. Prepare brownie batter: In a 2-3 quart heavy saucepan, melt butter on medium-low. Whisk in cocoa and cook until mixture bubbles. Remove from heat and whisk in sugar and preserves. Whisk in eggs and vanilla until thoroughly blended. In a small bowl, stir flour and baking soda; add to chocolate mixture, stirring just until blended. Pour batter into baking dish and smooth top. Prepare swirl topping: With mixer on medium speed, beat cream cheese, sugar, egg, and extract until blended. Fold in raspberries. Spoon large dollops of topping over brownie batter, spacing evenly. With knife, swirl topping into batter. Sprinkle with the almonds, if using. Bake 30-35 minutes or until toothpick comes out clean with a few moist crumbs attached. Cool completely in pan on wire rack.